The french press is one of the world’s classic coffee makers. 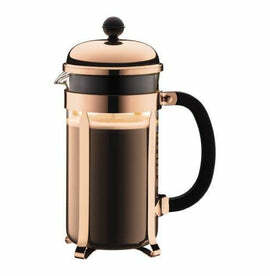 The Bodum Chambord Copper 3 Cup press pays tribute to the original french press design but features a hint of contemporary design as well: a copper-plated finish. The french press is one of the simplest ways to brew coffee: combine hot water and coarse coffee grounds and let it sit. Wait four minutes, then pour out the coffee. The 3-piece stainless steel filter allows aromatic oils and micro-particles to enter your mug, contributing to a full body and rich flavour, while reducing paper filter waste. This 3 Cup press can brew up to 350 ml of delicious hot coffee, cold brew coffee, or tea. The chrome plating undergoes several processes to produce an ever-shiny and durable surface. Traditional methods are not environmentally sensitive, but since the 50’s, Bodum has adopted new technologies and practices to reduce their ecological footprint. 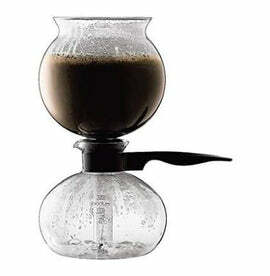 The borosilicate glass carafe and handle are both heat-resistant. 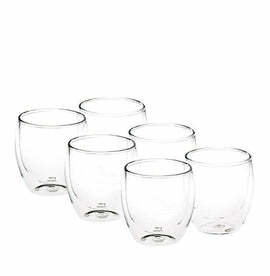 The carafe, stainless steel frame, and stainless steel filter system are all dishwasher safe. 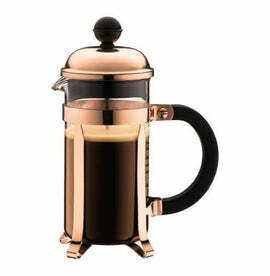 Copper-Plated Finish - A modern take on the classic coffee brewer. Simple Design - User friendly and easy to use, thanks to a few reliable parts. Multi-Purpose - Brew hot coffee, cold brew coffee, or tea in this versatile brewer. Rich Flavour, Full Body - Brew coffee that expresses its full range of flavour via the stainless steel filter system, which allows coffee oils and micro-grounds to enrich your final cup. 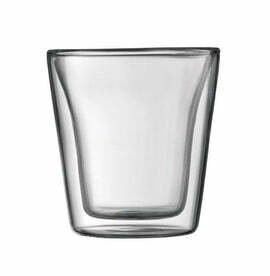 Long Lasting - Heat-resistant borosilicate glass and a stainless steel frame and filter system will last for years. Environmentally Friendly - New processes for the chrome plating processes have a small, sustainable footprint. No need for paper filters means no paper filter waste.